Towards the end of the War in 1944, Yakovlev's Design Bureau at Saratov began to experiment with a versions of the superb Yak-3 mounting increasingly powerful engines. Of these, the Yak- 3U was the most daring. Mating the 1,850 hp ASh-82FN twin-row radial to the tiny Yak-3 airframe was indeed bold, but in the event the prototype gave little trouble. Much more of a complete redesign than its external appearance would suggest, the new model was built around a revised wing of 9.4 m span with larger chord, this mounted forward on the fuselage some 21.9 cm to improve the center-of-gravity. The pilot's chair was also moved aft slightly in the same vein, but apart from that the rear fuslege was essentially similar to a 1945 standard Yak-3. Testing of the Yak-3U was very successful. Performance in the new variant was blistering--it could acheive 438 mph at 19,250 ft., and climb initially at the unheard of rate of nearly 5,800 ft./min. Maneuverability was astonishing in the -3U, and no known fighter could stay with the type in combat flight. Indeed, the prototype was retained by the Yakovlev OKB staff in flyable condition for years after the War, and they delighted in pitting the Yak-3U against both domestic and foreign aircraft; no machine ever came close to matching it. However, the costs associated with production of this highly revised prototype in light of the end of the War meant that production was not ordered, despite its obvious potential. Yakovlev's new role, as well, was to design jet fighters, and so the formidable Yak-3U remained a single prototype. 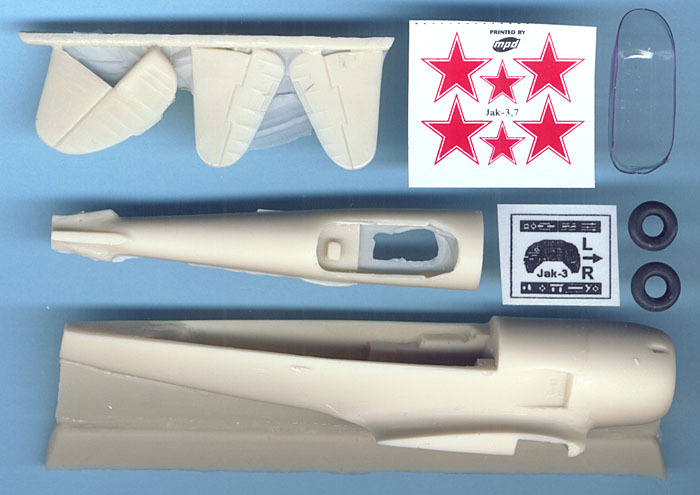 The Omega Models kit comes cast in a light tan resin of relatively nice properties. The surface condition of most parts is excellent; few air holes and other irregularities can be found. 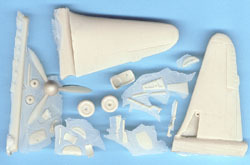 Twenty- seven resin parts, a vacu-formed canopy, and two rubber tires make up the kit's contents; a decal sheet with basic markings is also provided. The largest item in the kit by far is the single-piece fuselage which is molded in its entirety from the engine cowling to the aft end, minus the turtledecking. This is the first time that I have seen a single-engined aircraft so executed in a kit, and of course one wonders how it will build up? I do note that the fit between the turtledeck and fuselage seems to be ok, and also that this joint does follow an observable panel line. Some clean-up will be needed on the turtledeck part in my example, and the cockpit might be a bit sparse for those looking to produce a competition grade model. My largest concern with the fuselage, however, is the almost complete lack of detail anywhere on the part. Aside from two gun port openings on the cowling and inlet channels for the exhaust stacks, there really is no further detail anywhere. This will require quite a bit of scribing (or drawing for those who prefer) to achieve a useful looking fuselage on the finished model. A positive feature are the wing root fairings which are molded onto the fuselage; this is a nice touch, and much the way I prefer to have things done, personally. The general shape and planform of the fuselage appears to be accurate, and there are no obvious problems here. The wings are very nicely molded single-piece units with very good recessed panel line detail. This fact is all the more disappointing, however, as the wings are really 9.2m ("Yak-3 type") metal units appropriate for the Yak-11 trainer, and not 9.4m wood-laminate units with revised planform as carried on the Yak-3U [the AJ Press Monograph #13 has a set of good drawings, for example]. To produce accurate wings for this aircraft, one will need to fill in the majority of panel detail and re-shape the wing leading edge, at a minimum (I suppose one could quibble over 20 cm in 1/72). 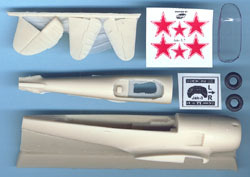 The vertical and horizontal stabilizers are all one-piece jobs, and the examples in this kit are rather nice. In particular, I like the way in which the fabric covering is represented on the flying surfaces. The various sundry details, such as landing gear doors, oleo struts, etc., all seem to be well done. One odd bit is the inclusion of these small rubber tires (nicer resin units are included as well); I suspect that most modelers will find alternate methods of employment for these parts. The six national markings decals seem to be fairly nice, and I suspect one will have no trouble with them on the finished product. Overall, the model does strike me as entirely buildable, and some of the kit features are rather nice. On the other hand, the amount of effort required to achieve this goal would be higher than expected in a kit of this type and price range, and this might be seen as a negative factor. I also do note, though, that by chopping off the nose one could easily produce a Yak-11, Yak-3 VK- 107, Yak-3 KV-108, and Yak-3 all-metal 1945 machine (not to mention a model of the current manufacture "Yak-3M" Warbird) using this kit; not at all a bad prospect. I would recommend this model for those whose skill level is above Beginner; anyone with this level of accomplishment who is familiar with resin kits should be entirely successful. Our thanks to VAMP for the review sample.